Donald Trump - a psychopath? "US presidential candidate Donald Trump possesses stronger psychopathic tendencies than Adolf Hitler, academics from the University of Oxford have suggested." "Researchers assessed this year's candidates for the White House to determine how highly they ranked on the psychopath scale. They were scored on a number of personality traits typical in psychopaths - including fearlessness, cold-heartedness and egocentricity. While the study found Donald Trump's score puts him in the company of some of history's greatest despots, including Hitler and Ugandan dictator Idi Amin, his opponent Hillary Clinton found herself alongside Napoleon Bonaparte and Emperor Nero. The study contended that although psychopathy - typically associated with remorseless killers - exists along a spectrum, some people can possess certain qualities without developing murderous intent." As a Brit I have no real knowledge of Trump's history and qualifications to be the US President, but while watching his progress in the run up to the election I was amazed by his popularity. In a bid to understand this phenomenon, I was planning to buy his supposed autobiography, 'The Art of the Deal'. Is he really fit to lead the most powerful country on the planet? To have the nuclear codes - which will include the ability to launch Britain's so-called independent nuclear deterrent? My own suspicions about his character, and the possibility he is a psychopath, came into sharp focus after reading the commentary from Tony Schwartz, the man who got to know him very well while ghost writing Trump's book. If he were writing “The Art of the Deal” today, Schwartz said, it would be a very different book with a very different title. Schwartz had written about Trump before. 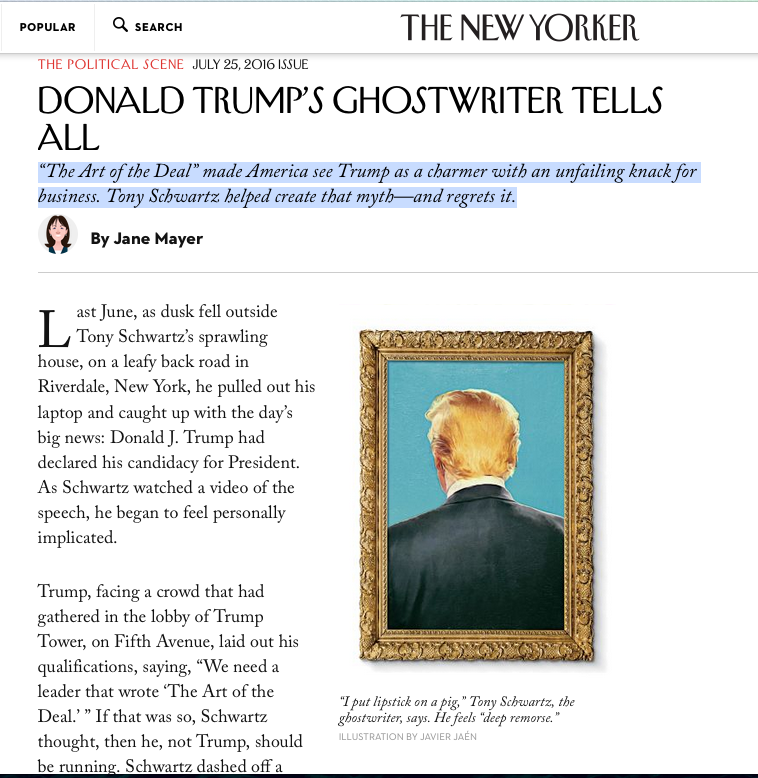 In 1985, he’d published a piece in New York called “A Different Kind of Donald Trump Story,” which portrayed him not as a brilliant mogul but as a ham-fisted thug who had unsuccessfully tried to evict rent-controlled and rent-stabilized tenants from a building that he had bought on Central Park South. Trump’s first wife, Ivana, famously claimed that Trump kept a copy of Adolf Hitler’s collected speeches, “My New Order,” in a cabinet beside his bed.